What is today's most important beverage ingredient? You might say it is the latest sweetener that can provide intensity without anxiety. Or we could salute the expanding palate of natural colors, or maybe those fruit and vegetable juices with their antioxidant powers. There are good arguments to be made for any of these. So what about the beverage ingredient of tomorrow? Well, it might be yet another new sweetener, or it might be the cucumber. Just last month Sunny Delight Beverages Co., Cincinnati, Ohio, rolled out two new flavors of its Fruit2O flavored water, and one of those was Lemon Cucumber. Whatever the beverage ingredients of future are, there is a pretty good chance they will be all-natural and good for you, says, Kelly Weikel, senior consumer research manager with market research firm Technomic Inc., Chicago. "One of the main trends is that consumers are looking for natural ingredients when they look at beverages," she said. "They also realize that a lot of the calories that they are getting are not just from food, but also from beverages. So I think they are saying to themselves: ‘If I am going to be consuming this many calories through beverages, I expect them to contain something that is good for me.'" PepsiCo just launched Mountain Dew Kickstart in February, a combination of carbonated soft drink, juice and energy beverage. See Kickstart in our New Product Database. The folks at PepsiCo, Purchase, N.Y., see a bright future for a very familiar beverage component — caffeine. PepsiCo's Mountain Dew Kickstart is a new line extension that makes the carbonated soft drink into even more of an energy drink while offering a splash of real fruit juice – and positioning it for breakfast. While Kickstart uses commonplace ingredients, if the company is successful in creating a hybrid category — the morning carbonated soft drink — other innovative ingredients might find their way into a succession of Kickstart wanna-bes. 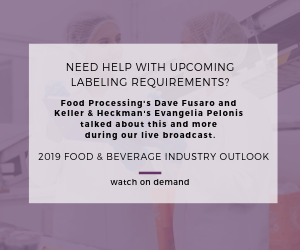 Whether it's a matter of discovering new ingredients or finessing applications of the tried-and-true, there should be plenty of innovation around the bend for beverage ingredients. In discussing what the future might hold for beverage ingredients, David Meggs, director of business development at Purac, Lincolnshire, Ill., also expects the "more natural" theme to continue, and he points to stevia as a key example. "The application of stevia in beverages is becoming increasingly accepted," he notes. "This is stimulated by the improved quality of stevia extracts themselves, as well as the stevia masking offerings on the market." Stevia has only been available as a sweetener in the U.S. since 2008. It is extracted from one of more than 200 species of the stevia plant. Stevia's taste has a slower onset and longer duration than that of sugar, although some of its extracts tend toward a bitter (sometimes described as licorice-like) aftertaste at high concentrations, says Olsen says. So Golazo uses it in combination with organic cane sugar to achieve a mildly sweet flavor. The products contain about half the sugar of leading sports drinks (21g per 12-oz. serving). And while it took years for the FDA to approve stevia for the U.S. market, the sweetener wasn't approved in Europe until late 2011 and in Canada in November 2012, notes Cecilia McCollum, executive vice president of Blue California. The company was an early supplier of stevia in the U.S., creating products under the name Good&Sweet. Extracts are available at purities up to 99 percent. Cargill Inc., Wayzata, Minn., was one of the original FDA petitioners for stevia, and has achieved great success in creating a tabletop sweetener under the brand Truvia. Its website has lots of information to help formulators learn more about Truvia, stevia in general and other sweeteners. Monk fruit is at the front of the pack of those "other sweeteners." It's been around for centuries under its Asian name luo han guo but made only a small dent in the North American market until Tate & Lyle Plc brought it to the fore in 2011 under the name Purefruit. Like stevia, it's natural, coming from a plant, is non-nutritive and is 200-300 times as sweet as sucrose. And as it did with its sucralose sweetener, Tate & Lyle is providing commercial quantities to food processors while turning over marketing of a tabletop version, called Nectresse, to McNeil Nutritionals (which markets sucralose as Splenda). Perhaps hedging its stevia bet, Blue California introduced BlueSweet luo han guo extract. And U.S. Niutang Chemical Inc. plans to introduce two concentrations of monk fruit sweeteners, tentatively called Fruit20 and Fruit50, denoting the percentages of the mogroside. Both stevia and monk fruit extract allow for partial or total replacement of sugar's calories with a natural, plant-based ingredient – a powerful one-two punch for consumers. Technomic's Weikel notes that green tea already is a popular flavor in foodservice channels. For both its nutraceutical benefits and its flavor, tea has done well at retail also. It's been 15 years since Seth Goldman and Barry Nalebuff founded Honest Tea in Maryland. Their company changed the RTD tea category by using all-natural and organic ingredients and by offering premium products with more nuanced flavors. They also marketed many of their tea and fruit beverages as "just a tad sweet." Honest Tea is now a successful wholly owned subsidiary of Coca-Cola Co., and its products are sold not only in natural foods outlets, but in pretty much every channel that the soft drink giant has penetrated. Goldman has long argued that beverage makers haven't always given consumers what they want, and that sometimes what they want can be less sweet. Just last month the group went into broader distribution with Honest Fizz, a line of zero-calorie carbonated soft drinks sweetened with a combination of erythritol and stevia. "Honest Fizz is fun, tasty and naturally sweetened, and it will help us connect with soda consumers seeking a naturally sweetened alternative, as well as with shoppers at natural and specialty stores looking for a zero-calorie soda option," Goldman says. TruBruz is a new line of tea, coffee and cocoa flavors from Flavor Producers that contribute authentic brewed flavor profiles, says Janet Guzman, vice president of sales and marketing at the Valencia, Calif., company. The line includes several varieties of green, black and white teas available in liquid, water-soluble essence, extract and flavor forms. They can be delivered in natural, non-GMO or certified organic forms. Flavor Peelz is another interesting addition to Flavor Producers' portfolio. Peelz is a patented, dry flavoring system that uses dehydrated orange peels to encapsulate (actually, simply to absorb) liquid flavors and then release them during the brewing, baking or cooking process. Tea flavor is one thing, but its nutraceutical benefits are substantial others. Blue California also manufactures several forms of green tea extract under the name L-TeaActive. The emphasis is on the tea components epigallocatechin gallate (EGCG) and L-theanine, the latter of which provides both focus and relaxation, the company claims. Scientific studies suggest EGCG can be used in dietary supplements for weight management and cardiovascular health. Recent lawsuits and congressional inquiries notwithstanding, America and much of the world still has great interest in energy-promoting libations. While the first generation of products was knocked back as a shot – the less you tasted the ingredients the better – new focus is on making these energy drinks taste better. Richard Tait is a long-time soccer enthusiast with a background in product development with Seattle coffee giant Starbucks. His skills and passion came together a few years ago when he launched his own beverage brand, Golazo. "We knew our customers wanted a really good-tasting product that was all-natural, GMO-free and had a lot less sugar and sweetness," says Todd Olsen, lead product developer. "If you were to taste most of the energy drinks on the market, most of them are very heavy and sweet, and we saw that that was not what our customers wanted." So taste became a prime consideration in developing this line of natural sports beverages geared to soccer players and enthusiasts. The company offers a hydration/energy sports drink for adults and a hydration refreshment sports drink for adults and kids. The products are sold in Whole Foods Markets, Safeway and Kroger-owned stores and other outlets from Seattle to San Francisco. Golazo's flavors are keyed to Latin fruit flavors including Jamaica and Mango-Limón. Mango Limón is also the flavor base for the single sugar-free offering in the line. Recently Hain Celestial, Boulder, Colo., added Enerji Green Tea Shots to its Celestial Seasonings Natural Shots product line, which was first introduced in 2011. The company is hopeful that the well-established natural halo of Celestial Seasonings brand, with its 40-year-old line of teas, will provide a strong point of differentiation in a category dominated by one big brand. Flavor was an important consideration for Mountain Dew Kickstart, as well. Familiar Orange Citrus and Fruit Punch are the initial flavors. The drink boasts 5 percent "real fruit juice," 80-calories per 16 oz. can and "just the right amount of caffeine". As Purac's Meggs points out, natural colors now outsell artificial colors in the U.S. Ingredient companies began expending their fruit and vegetable based natural color offerings a decade ago as more and more food companies sought natural alternatives. Emina Goodman, technical support manager for the beverage and dairy group at Sensient Colors LLC, St. Louis, says many beverage customers come to Sensient looking for better stability in natural colors. "Some companies require preservative-free natural colors to achieve a clean label," Goodman says. "However, eliminating preservatives from natural color systems significantly reduces shelf life." Sensient offers an aseptic packaging system that provides a solution through preservative-free natural colors that have a shelf life comparable to preserved colors. "In addition to natural colors, we offer additional benefits, including kosher, allergen-free, and GMO-free options that satisfy today's beverage consumer," Goodman adds. The company also offers an Advanced Emulsion Technology (AET) which allows for multiple oil and water based natural colors to co-exist in a single color system. This improves color consistency and achieving new natural color shades that were previously unattainable, Goodman says. D.D. Williamson, Louisville, Ky., is a supplier of colors to the beverage industry. Last month the company released results of a study it conducted on the relationship between color and flavor perception in carbonated soft drinks. A dozen teenagers were given drinks with the same flavor but remarkably different colors. Only a small percentage determined that the beverages were the same flavor. Not surprisingly, color matters when it comes to beverages. Making beverages more healthful has gotten easier too. Many suppliers offer functional ingredients of all kinds for beverages, including vitamins, minerals, proteins and energy ingredients. Purac specializes in minerals, including calcium and acidulants that can help formulators adjust pH properly. This in turn makes it easier to use natural colors and high intensity sweeteners. "We see a strongly increasing demand for Purac Fit Plus, driven by the growing use of stevia and natural colors," Meggs says. "Replacing some of the citric acid with Fit Plus can increase the stability of natural colors and balance out the lingering sweetness of stevia."